Following on from contract manager Arran Barton’s success in being shortlisted for Employee of the Year in the Wakefield District Business Awards, Calder Security has also been shortlisted for SME of the Year! We’ll find out whether we’ve been successful at the awards dinner on 20th June. As Business of the Month winners in the Mid Yorkshire Business Awards run by Mid Yorkshire Chamber, Eaton Smith and UKTI we also go through to the overall Business of the Year Award and we’ll find out about that on 5th July. Fingers crossed (and please vote for Arran in the Wakefield Express!). 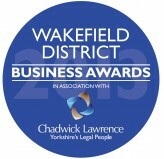 Update – July 2013: Sadly we missed out on both the Wakefield District Business Awards and the Mid Yorkshire Business of the Year Award. Ossett Brewery and YTM Group respectively winning the awards in our category. While naturally disappointed not to win both companies were worthy recipients and we extend our congratulations to them. Maybe next year!